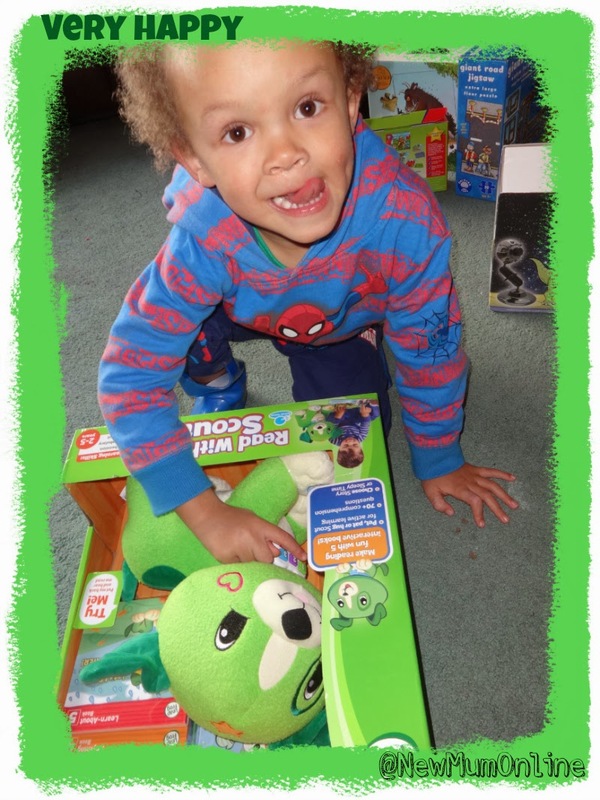 From the minute the LeapFrog Read With Me Scout arrived (he also has a sister called Violet) it was love at first sight for Aaron, even when he was still in the box! It's an educational toy we have had both had a lot of fun with. We have had it since November 12th so I can give you an honest account of the last few weeks. It comes with 5 hard back small books that are actually great in their own right. The books are sensitively written. The one about emotions is so cute, and perfect for Aaron who is very thoughtful and observant of moods. We also enjoyed the one about the weather as we talk about the weather everyday. The party book is great for learning colours. Aaron's not great when I ask him to look for something, so I like him reading "Let's find Scout's Toy" in the hope he might copy the searching skills :-) Let's Go Camping teaches them their numbers. Although it is a toy aimed at 3-5 year olds, I'd say it is best bought when the child is no older that 3. I only fear that if the child was older, they'd find it a little baby-ish. With that said Aaron is 3.5 years exactly (June 2010 baby) and he LOVES it. He's known his colours for over a year, but is just learning to visually recognise numbers. Plus until now he has always wanted me to read TO him but now he is independent enough to sit with Scout and read with HIM. Except of course when he is in need of a cuddle or being a threenager! There is a volume switch on his belly - just move the velcro out of the way. The on off switch is on his dog collar and easy for little ones to use/access themselves. They tend to whack it to on, but halfway across there is a lovely lullaby setting for bedtime stories (so you don't need to pat his head everytime you turn a page). The books are colourful and fun. Aaron took to the toy from the second it arrived. There's a beautiful rhythm to the stories, that we have both enjoyed. Aaron now recognises his numbers but when it first arrived he would choose the book, and then know which button on Scout's collar to press from the colours on the buttons/books. He can happily do this without parental supervision. If you have an early reader/pre-schooler in your house, or one you'd like to buy a Christmas present for, I can honestly wholeheartedly recommend it. Read With Me Scout is a playful toy pup that reads and asks questions. It's an interactive get ready-to-read toy that's doggone fun! Scout reads from the five included board books, and engages children by asking questions throughout the story to help build comprehension skills. Scout features 5 interactive spots that respond to your touch. You can pet his back to answer questions; kiss his cheek and hear him say you're his best friend; press his left paw to hear songs; and press his right paw for more responses. As Scout completes each page, he will ask the child 1 of 70+ different engagement and comprehension questions over the course of the 5-book set. The 5 colourfully illustrated board books teach: 1) Rhyming—helps children learn about the sounds of language and build phonological awareness, 2) Learn-about—learn about the world through reading 3) Narrative—learn about how stories are put together, with characters, settings, and a sequence of events, 4) Pattern—learn with rhymes, refrains and repetition to predict what comes next, and 5) Concept—explore concepts like colours to label and classify new information. Research has demonstrated that the most effective read-alouds are those in which children are actively involved in asking and answering questions and making predictions rather than passively listening. 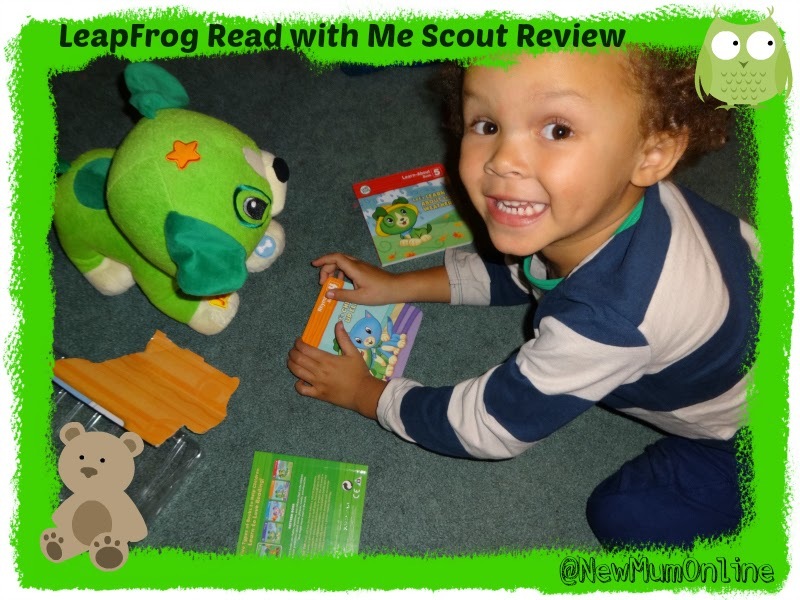 Read with Me Scout features 5 different book genres that promote a range of strategies for an educational and cuddly introduction to reading. Disclosure: we received this product in exchange for an honest review. All words/opinions are our own apart from where indicated otherwise. This looks like a great toy and I love that it has a volume switch! I've always seen this and not been quite sure what it does although it looks cool, so good to see the video! Ah bless him he looks the picture of happiness and I too LOVE that there's a volume switch! My boy has a Scout and a Leapad so I feel like we're sponsored by them in this house ! I agree the age ranges they give are a little over for my boy too, but this Scout looks great. Dammit, I thought I'd already done all my toy shopping !! Thanks for this, I'm so tempted to get one for C in the next year (she is 13 months old now). Sounds great! He looks very pleased with himself - we have got the baby version of this for Seb for xmas! Great review, very thorough and definitely something I will think about getting when my son is a little older. Love his cheesy grin in the last pic too.